The true origins of cheese-making are lost in the mists of time, but it is well known that cheese has been a popular and nutritious dairy product throughout Europe and the Middle East for centuries. Dating back thousands of years, cheese was originally made from sheep or goat’s milk. In its simplest form, goats cheese is made by letting the raw milk curdle, then draining and pressing the curds. More sophisticated techniques use rennet, vinegar or lemon juice to coagulate the milk. Aged, it is put in brine to form a rind, and then stored in a cool cellar or cave for several months.Today, there are over 2,000 varieties of cheeses world-wide. Cheese is a perfect snack with bread and wine to introduce, compliment or complete a meal. Cheese adds flavour to your cooking and can also be used to thicken sauces. 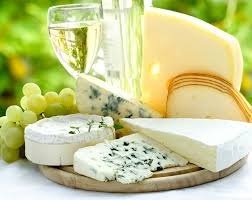 Varieties include hard cheeses like parmesan and pecorino, fresh cheeses such as ricotta and feta, chèvre (goat’s cheese), blue vein cheeses and surface rind cheeses like camembert and brie. As an Anglo-Australian I was raised on cheddar – on toast for afternoon tea (merienda) or with piccallily on sandwiches for school lunches – and I have fond childhood memories of gathering on our parents bed on Sunday mornings, for the weekly treat of cheese and tomatoes on crackers – my father’s piece of culinary genius, that inevitably ended with a bed full of crumbs after the enthusiastic nibblings of four small mice! This simple repast led to a lifetime’s devotion to cheese, and I developed a passion for cheese in all shapes, textures and tastes: tangy, biting blues like Stilton, or rich, creamy ones like gorgonzola; soft, ripe, runny, bries that engulf the tastebuds, and firm, salty pecorinos to accompany a glass of magenta Shiraz. Living abroad has always been a great adventure, but the presence of good cheese – or lack thereof – can make or break a posting for me. So imagine my delight to discover a handful of cheese-makers here in the Philippines. Traditionally, the Filipinos have been a nation neither of cheese-makers nor consumers, largely due to the negative effects of heat and humidity. As recently as thirty years ago, there was very little cheese available in the Philippines apart from Kraft and the local fresh white cheese made with carabou milk (water buffalos) and resembling buffalo mozzarella – kesong puti – which is popular for breakfast eaten with freshly baked pan de sal or sprinkled on top of puto (steamed rice cakes). That is changing. Over the past decade, innovative Filipino craftsmen and women have been learning the tricks of the trade. They have even invented a few of their own to deal with the tropical climate, with both creative and tasty results. Exhibiting dedicated perseverance, they have experimented with cheese recipes to discover those best suited to the climate and local taste buds. The traditional goats milk is still the most popular ingredient, but some cheesemakers also use sheep and carabou milk. Wandering down to the Fort, where I knew I could find some homegrown cheeses at Echostore, I discovered a surprising variety: feta and chèvre (goat’s cheese), cream cheese and ricotta, even a locally made version of Parmesan, ‘queso rustico,’ care of Olive Puentespina of Malagos Farmhouse Cheeses in Davao. And then there is Mambo’s Kesong Pinoy and Neufchatel. 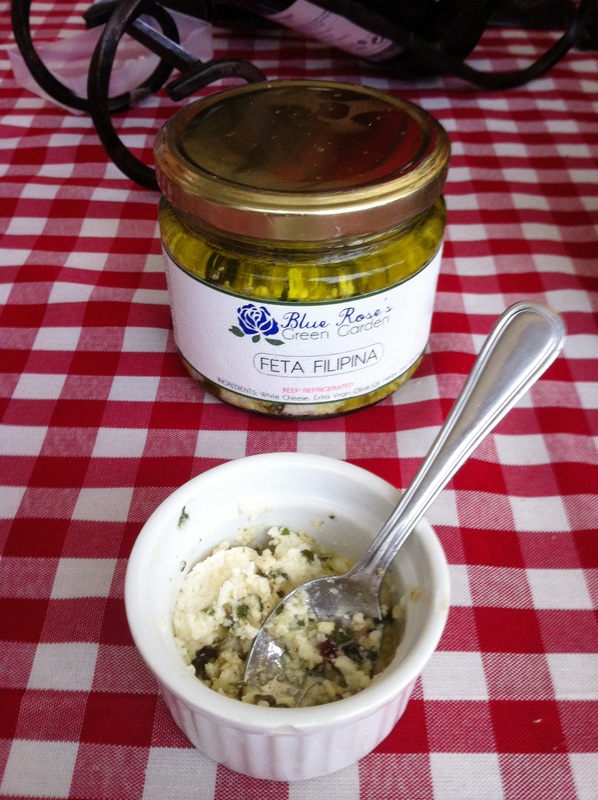 Another place to explore for cheese is the Sunday market at Legazpi, where I found a tasty “Feta Filipina” from Blue Rose’s Green Garden: a delicious and spreadable mix of feta and homemade pesto. Of course any cheese tastes good as a simple snack with bread or crackers, dried fruit or nuts, but it can be fun to experiment with something a bit more complex. Many of these local cheeses work well with simple Italian dishes. Use a feta or chèvre in a tomato salad; sprinkle queso rustico on pasta or kesong puti over a pizza, and ricotta is perfect for filling ravioli or in a baked cheesecake. But my favourite is still Sau del Rosario’s bruschetta made with grilled peppers and topped with thick slices of fresh goat’s cheese… irresistible! Finding traditional Filipino dishes that contain cheese can prove tricky, but it can be interesting to adapt favourite recipes by using local cheeses. Experiment with old favourites like macaroni cheese, or for those with a sweet tooth, cheesecake made with a local ricotta or neufchatel and mango … Enjoy! *Adapted from an article first published in COOK, September 2013. This entry was posted in Food & Wine, Local Culture, Philippines and tagged cheese, COOK magazine, kesong puti, Malagos Farmhouse, Mambo's, Sau del Rosario. Bookmark the permalink.